Comparing hot water heaters is an important task to complete for your renovation project. Water heaters are an integral part of your homes plumbing system with an average lifespan of 8 - 12 years. The type and use of heater has a lot of bearing on its longevity. The storage tank type is the most common found in homes accounting for approximately 80% of all water heaters purchased but tankless water heaters are starting to make a strong push in the industry. Hot water heaters are silent partners living in your home. You really never know they are there until you have no hot water. The problem with this is that once it breaks, there is usually no time to fully investigate what type of unit is best for your household and budget. 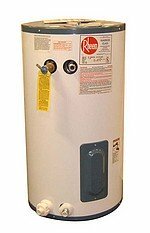 So if you are not replacing your water heater during your renovation, you should still at some point become familiar with the different types available. According to the US Department of Energy, hot water heaters account for 14% - 25% of the energy consumed by your home. So selecting the water heater that is best for your home and budget is important. Sometimes laying out a little more up front pays for itself in the long run. There are 5 different types of water heaters each with their own pros and cons. Before selecting one however, there are several factors to take into account. They are the size, fuel type, availability and cost. Each of these will play an important role in your selection. Just hover your mouse over one of the types below for a brief description. The sizing of your water heater is paramount for cost saving. Under sized units can leave you without enough hot water and oversized units just waste energy and cost you money. For storage type and heat pumps with tanks, units they must be sized to handle whatever the busiest time of day is for hot water consumption. This is called "First Hour Rating" (FHR). You can locate this information on the EnergyGuide label of the unit. You can use this worksheet to calculate your families peak usage. Demand water heaters are calculated differently. They should be sized based upon the number of gallons required per minute or the flow rate and the temperature rise for the largest fixture. Demand water heaters typically put out about 2 to 4 gallons per minute. This may not be sufficient if you only have one and you are using hot water at multiple locations such as a dishwasher and shower. Sizing a solar heater is a little more complicated that a storage or demand. The total collector area must be determined and the storage volume required to meet your households needs. It is best to speak to a solar system contractor to determine the system requirements. When shopping and comparing hot water heaters, look for the Energy Factor (EF). This rating is based on the recovery efficiency and standby losses of the unit. Look for the highest EF rating that fits within your budget. Other things to consider when looking at the efficiency is what type of fuel is being used. For example a natural gas unit may be less efficient than an electric one but the cost of electricity is much higher than gas. These factors must all be weighed.